And then there are the wisest travelers of all: those who love waterfalls. It’s no joke that the concept of a cascade of water falling through the sky, simple though it is, proves again and again to be one of Earth’s most captivating natural wonders. And though sometimes the hunt for the perfect waterfall vista can prove quite a trek, the spectacular feeling of fresh falling mist on the face and a gaze at the pure majesty of the natural world is a worthwhile way to spend a day, period. Sold on the concept? We thought you might say that, and so we’ve got you covered with this handy list of the most beautiful waterfalls in the world to guide you to your next adventure. Deep in the state of Karnataka lies the majestic Jog (or Joga) Falls, also known as the second steepest waterfall in all of India. At a towering 830 ft (253 meters), the falls offer commanding views of the downrush over an impressively lush Indian landscape. So, basically, if you’re a waterfall junkie traveling through India, Jog Falls should be on your list. When to go? Though pleasant throughout the year, Spring to early Summer (April to July) is the best time to go for a great balance between high water levels and low heat, as the temperatures tend to stay between 23 and 32 degrees celsius. In fact, pros go during the peak of monsoon season, when the falls are said to be at their most powerful. When to go? As with the rest of Iceland, Summer’s warmer weather and breathtakingly long days make for the best time to see the falls in all their splendor. Many suggest a visit in the afternoon, around 3pm-4pm for the best lighting over the cliffs. Kaieteur Falls, nestled deep in the Amazon, is considered to be one of the many priceless treasures of the rainforest, and of South America in general. It’s also the largest (single drop) waterfall if you’re counting by volume of water, so prepare to get wet! Clocking in at 741 feet (226 m), Kaieteur offers a great glimpse into the dramatic splendor of nature as well as a little bit of awe-inspiring adventure. But don’t be fooled by the somewhat remote location, Kaieteur was discovered in 1870 and has been a must-see travel experience nearly ever since. When to go? Weather in this region can be somewhat unpredictable, making it hard to determine when to best see the falls. Aim for a warm (but not hot) and dry day. Dry season in Guyana runs from March to June, making it an appropriate time to plan your adventure. When you think waterfalls, you might not immediately picture Eastern Europe. But to pass up Plitvice Falls in Croatia would be a true rookie mistake. Plitvice Falls, which is part of Plitvice Lakes National Park (the largest National Park in Croatia) clocks in at 255 ft (77 m), making it a sight to see! Don’t believe us? Just ask the nearly 1 million yearly visitors who have been making a pilgrimage to these lovely falls every year since 1949. When to go? Summertime (July, August, September) is peak tourist season, and for good reason. Summers in Croatia feature warm temperatures and sunny skies. However, prices may be inflated during this season, and weather sometimes goes from warm to hot. For a less crowded experience, and a chance to catch a glimpse of some Fall colors, Autumn may be a better bet. Few have experienced the impressive beauty of California’s Yosemite National Park and not emerged in awe. And fewer still have noted the grace and the grandeur of Yosemite’s truly towering falls (they clock in at a gasping 2,425 ft or 740 m) and not returned home singing their praises. Yosemite Falls is, plainly put, absolutely massive and absolutely beautiful. And though the hike to the upper falls may be strenuous, it’s undoubtedly worth the experience. However, it’s also large enough to be enjoyed at a distance for those not able to make the journey to the top. When to Go? Spring is the best season to visit Yosemite Falls as the wildflowers will be in bloom and the weather will be warm but mild. Don’t let the myth of “California weather” fool you, winter visitors to Yosemite can expect snow, and somewhat compromised waterfall vistas. When is a waterfall also a visit to two countries for the price of one? 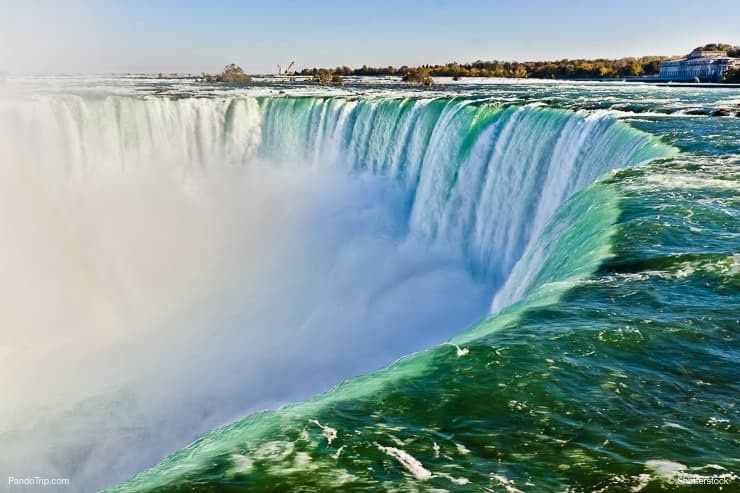 When that waterfall is the mighty Niagara, which famously straddles the border of the US (via New York State) and Ontario, Canada. The falls are impressively high at 167 feet (or 99 meters for you Canadians) but equally impressively long, stretching on for what feels like forever. And while the Canadian side boasts a touristy town to spend the weekend, the American side trades mostly in natural, scenic views. Both are worth a visit to get the full experience of seeing the falls. When to go? For blue skies and high waterfall rainbow visibility opportunity, visit between May and September. And while those making the trip in the winter shouldn’t expect the falls to freeze, they should bundle up or risk freezing themselves. At a truly impressive 3,212 feet (979 meters), Angel Falls is world’s highest singular waterfall; not to mention the tallest waterfall on our list! For visitors to Venezuela it’s an absolutely must-see attraction. As it it’s sheer height wasn’t awe-inspiring enough, Angel Falls also considered a UNESCO World Heritage Site, and was claimed to be discovered by famed explorer Sir Walter Raleigh on his search for the city of El Dorado. Modern visitors to the falls are in for quite a journey upriver, as Angel Falls is still considered quite remote. But intrepid waterfall hunters will be rewarded with a visit to one of the most spectacular sites on Earth. When to go? Most if not all river trips take place between June and December, when the water levels are high enough to ensure safe river passage and the views are the most brilliant. Trips at other times of year may not be possible, so plan accordingly. Like with Niagara Falls, Iguazu Falls is a two-country-one-landmark special, as it straddles the border of Argentina and Brazil. But if two stamps in your passport aren’t enough of a reason, these Falls are also considered the largest waterfall system in the world. Though Iguazu is only 269 feet (82 meters) tall, its curtain of water extends for over 5,249 ft (1,600 meters). It’s so long in fact that when Eleanor Roosevelt looked at it, she’s rumored to have exclaimed “Poor Niagara!” Don’t believe her? Go see it for yourself. When to go? The falls are scenic year-round, so the best time to go depends on your focus. In the months of December, January, and February, the falls are at their strongest, but the weather may be wet and rainy. March-April and August-September will find you in drier climes, but the falls may be a bit more crowded. It’s no surprise that the top of the list features the most famous waterfall in the world: the truly commanding Victoria Falls. They are located on the border of Zambia and Zimbabwe and accessible via the Western Zimbabwe town of the same name. So, why is Victoria Falls number one? Though technically not the tallest (at a mere 355ft, or 107 meters) or widest, Victoria Falls is commonly known as the largest in the world for its impressive sheet of rapidly falling water. These falls are iconic, and many visitors to Africa take a special journey to Zambia or Zimbabwe just to take in views described as “once in a lifetime” by many. Known as a popular touristic site since the turn of the last century, Victoria Falls’ popularity has only grown in recent years, and will likely continue to grow in the years coming. When to go? The temperate year-round weather around Victoria Falls only adds to its popularity. However, summers can be hot and too dry to see the falls in full form, making the best views under the clearest skies between March and August.